tachometers. 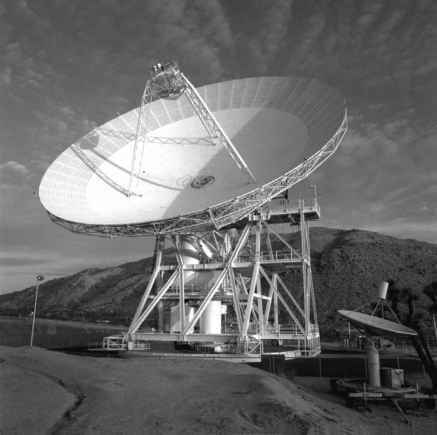 For more details about the antenna and its control systems, see  and , or visit the web page http://ipnpr.jpl.nasa.gov/. The finite-element model of the antenna structure consists of about 5000 degrees of freedom, with some nonlinear properties (dry friction, backlash, and limits imposed on its rates, and accelerations). However, the model of the structure and the drives used in this book are linear, and are obtained from the field test data using system identification procedures. Figure 1.5. The Deep Space Network antenna at Goldstone, California (courtesy of NASA/JPL/Caltech, Pasadena, California). 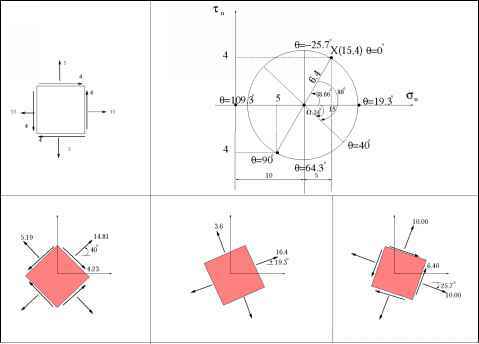 It can rotate with respect to azimuth (vertical) axis, and the dish with respect to elevation (horizontal axis). In the following we briefly describe the field test. We tested the antenna using a white noise input signal of sampling frequency 30.6 Hz, as shown in Fig. 1.7(a). The antenna elevation encoder output record is shown in Fig. 1.7(b). From these records we determined the transfer function, from the antenna rate input to the encoder output, see Fig. 1.8(a),(b), dashed line. Next, we used the Eigensystem Realization Algorithm (ERA) identification algorithm (see , and Chapter 9 of this book) to determine the antenna state-space representation. For this representation we obtained the plot of the transfer function plot as shown in Fig. 1.8(a),(b), solid line. The plot displays good coincidence between the measured and identified transfer function. The flexible properties are clearly visible in the identified model. The identified state-space representation of the antenna model is given in Appendix C.3. Figure 1.6. 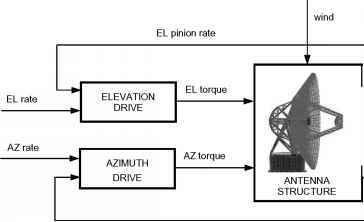 The open-loop model of the Deep Space Network antenna (AZ = azimuth, EL = elevation, XEL = cross-elevation): The AZ and EL positions are measured with encoders, EL and XEL errors are RF beam pointing errors. Figure 1.7. Signals in the identification of the antenna model: (a) Input white noise (voltage); and (b) output-antenna position measured by the encoder. Figure 1.8. The antenna transfer functions obtained from the data (dashed line), and obtained from the identified model (solid line): (a) Magnitude; and (b) phase.